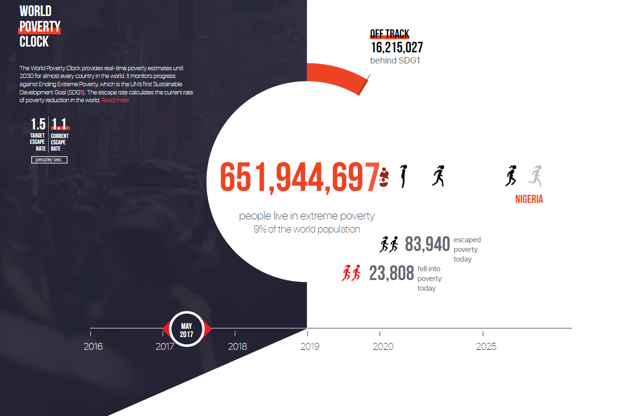 Last week, the World Poverty Clock was launched. The tool measures the world’s progress in real time toward the first of the 17 United Nations Sustainable Development Goals (SDGs), the goal “to end to poverty in all its manifestations by 2030.” According to the clock, the world (it covers 187 countries) is making progress (with 1.1 people per second escaping poverty), but not fast enough to meet the goal of SGD 1 (an escape rate of 1.5 people per second). Africa faces particular challenges when it comes to ending poverty. As former Brookings Fellow Laurence Chandy wrote in 2015, though the share of Africa’s poor is falling, the number of Africa’s poor is rising. He argues that inequality, high population growth, a mismatch between where growth is occurring and the poor are, and the actual depth of Africa’s poverty makes it that much harder for the region to get out. The World Poverty Clock contrasts the progress made by Africa to the rest of the developing world. As of this writing, 408,213,640 people in Africa live in extreme poverty, with a current escape rate of negative 11.8 per minute. According to the clock, more people are falling into extreme poverty than are escaping it. South America is also struggling with a negative escape rate of -1.9. This is in comparison to Asia, which has an escape rate of 77.5 people per minute, projected to have two-thirds of the world’s middle class by 2030. For more on the methodology and findings of the World Poverty Clock, see here.